I will be on the beautiful Big Island of Hawaii next week working with the Pacific International Space Center for Exploration Systems (PISCES). As I've described in previous posts, PISCES is an international research and education consortium headquartered at the University of Hawaii at Hilo that aims to develop, test, and validate technologies for use on the Moon, Mars and beyond. When humans return to the Moon and journey to Mars, they will have to live off the land. It's just too costly to bring everything we need with us. That includes rocket fuel for the return trip, water, oxygen, and other consumables. Thus, it is critical that we learn how to utilize in situ resources if we are to establish permanent presences on other worlds. As a geophysicist by profession, my interest lies with applying my terrestrial geophysical exploration knowledge to other planetary bodies. To this end, I carried out experiments at FMARS in 2009 and MDRS in 2010 to study the human factors elements associated with astronaut-conducted geophysical surveys to prospect for subsurface resources like water. I presented my findings at the Lunar and Planetary Science Conference and Lunar Science Forum, the results of which became my UND master's thesis. Now, I am embarking on a Ph.D. at the University of Hawaii to take this work to another level in analog environments such as Hawaii. 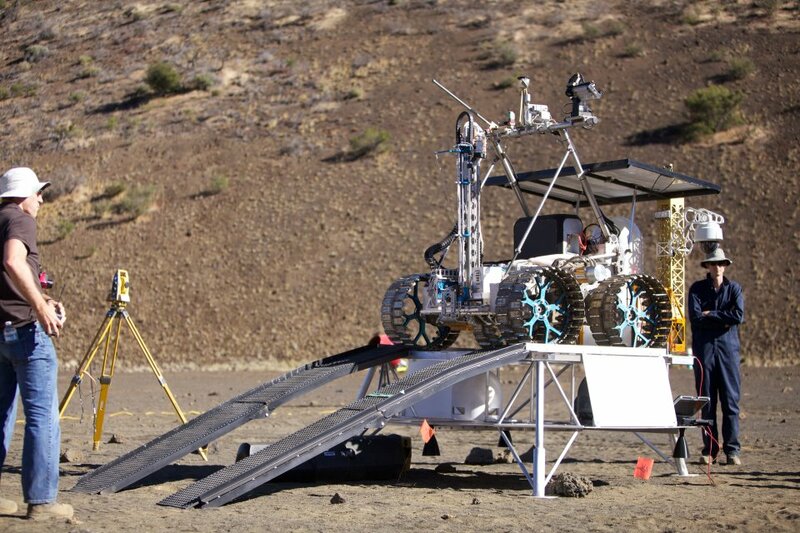 The main system being tested at PISCES this year is the Regolith and Environment Science and Oxygen and Lunar Volatile Extraction (RESOLVE) experiment. This consists of a lunar rover and drill provided by the Canadian Space Agency (CSA) to support a NASA payload that turns regolith (dirt) into rocket fuel, water, and air. A system developed from the RESOLVE prototype may travel to the Moon in the next few years to prove that water seen from orbit is accessible and that useful products can be made from it. It could be the key that finally makes the solar system accessible to humans in a safe, cost-efficient manner. This is the third field season for the PISCES program. I had previously tried to get involved with the 2008 and 2010 field campaigns and am happy that things worked out this time for me to join the effort. My main job will be supporting whatever the NASA and CSA engineers need me to do. I'll be learning from them and finding ways my talents can fit into the larger picture of planetary resource prospecting. In turn, I'll mold my upcoming doctoral work to extend and further enable the goals of initiatives like RESOLVE to support exploration of the solar system. For example, I think I could bring a lot to bear on the question of knowing where to look for resources, although the objective of this week's field work is to test how to dig and process the materials. These are questions the new company Planetary Resources is addressing in the context of asteroid mining too. Some media outlets have already picked up this exciting story. For example The Hawaii Tribune Herald recently ran a story about how Hawaii Governor Abercrombie signed a bill into law paving the way for the creation of a lunar research park on Hawaii Island. It discussed the benefits not only to planetary prospectors but also to local residents. After all, in space you have no other option but to be "green" and use all available resources. Technologies developed for space have direct application here on Earth to lesson our environmental footprint. MSNBC and Popular Mechanics had really nice articles about the experiment in the larger context of space mining too. NASA has invited reporters out to the field site on Thursday, July 19, and I'll be helping with the PISCES outreach day at the Imiloa Astronomy Center on Saturday, July 21. I'll post again in about a week to describe more specifically how the field testing went. Meanwhile, you can read up on the experiment on NASA's website and follow the NASA In Situ Resource Utilization Facebook page. I am Indian, Does i applicable for an Astronaut Program? And I am Currently doing Final (B.E-Aeronautical Engineering), Anna University, India. I am not sure about any current astronaut opportunities within India. Rakesh Sharma and Ravish Malhotra trained and flew as cosmonauts through the Russian program. Kaplana Chawla was an Indian-American who was selected by NASA and flew and flew on the ill-fated 2003 Space Shuttle Columbia disaster. Sunita Williams is a current NASA astronaut of Indian descent with a great deal of spaceflight experience. She even ran the Boston Marathon from the ISS!